To facilitate comparative analysis the ten studies follow a common structure, informed by an activities-based approach to describing and analysing NSIs, which addresses the critical issues of globalization and the consequences of innovation for economic performance. The final chapter compares ‘fast growth’ and ‘slow growth’ countries, concentrating on issues of innovation policy. The results illustrate the usefulness of an activities-based approach to studying NSIs, point to distinctive national roles within an increasingly differentiated international division of labour and address the key themes of ‘selectivity’ and ‘coordination’ in innovation policy. Edquist, C., and Hommen, L. (Eds.). (2008). 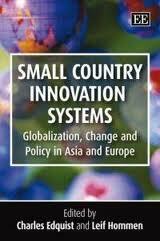 Small country innovation systems: Globalization, change, and policy in Asia and Europe. Edward Elgar Publishing (published in paperback 2009), 544 pp.